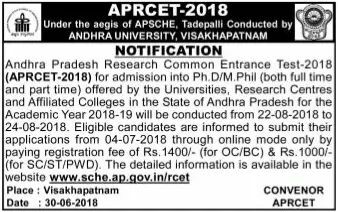 APRCET 2018 Notification: Andhra Pradesh Research Common Entrance Test-2018 (APRCET- 2018) for admission into Ph.D/M.Phil (both full time and part time) offered by the Universities, Research Centres and Affiliated Colleges in the State of Andhra Pradesh for the Academic Year 2018-19 will be conducted from 22-08-2018 to 24-08-2018. Eligible candidates are informed to submit their applications from 04-07-2018 through online mode only by paying registration fee of Rs.1400/- (for OC/BC) & Rs.1000/- (for SC/ST/PWD). The detailed Information is available in the website are sche.ap.gov.in/rcet, andhrauniversity.edu.in. I have submitted my application ,16th August is a date to release the admit card till now it has been not released . Kindly help me with the information. Did anybody knows, where online exam could be conduct?